David Holt (born October 15, 1946 in Gatesville, Texas) performs and preserves traditional American music and stories. A four time Grammy Award winner, Holt plays ten acoustic instruments and has released recordings of traditional mountain music and southern folktales, hosts Riverwalk, a jazz program on public radio; Folkways, a television program on folk music and culture, Great Scenic Railway Journeys and North Carolina Mountain Treasures on North Carolina public television. Holt performed with Doc Watson from 1998 to 2012. 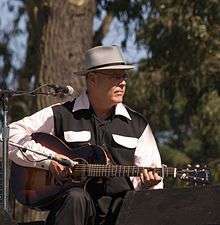 Holt performs wearing his trademark fedora, preferring vintage examples from the 1930s and 1940s. Holt and his wife, Ginny, have two children. His son worked for NBC in New York City. His daughter died in 1989 at age 10 following a car crash. ↑ "David Holt | Profile on". Ted.com. 22 February 2009. Retrieved 23 June 2012. ↑ "David Holt - Host Profile". riverwalkjazz.stanford.edu. ↑ Reinhardt, Susan (2 June 2013). "On grief after the loss of a child". Asheville Citizen-Times.